Windows Operating System is equipped with many addons and components which may extend the functionality of Windows without using any third party software. Some of these components are enabled or installed by default. But all features need not to be enabled because it will slow down the performance of your computer. Moreover all users do not require all that features to be enabled. Some components are also required by third party software to function correctly e.g., .NET Framework 3.5. 2 1- How to turn Windows features on or off? 3 2- How to turn Windows features on or off using command line? We will discuss how to turn on/off those features using command prompt and manually. Moreover we will also describe how to find and open optional features using command line. 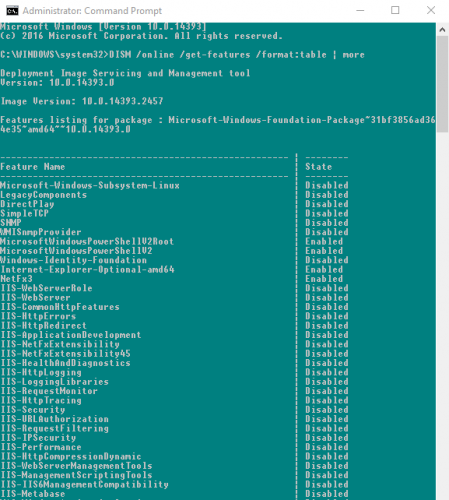 Further we will briefly elaborate how to install Windows features from installation source using command prompt and PowerShell. 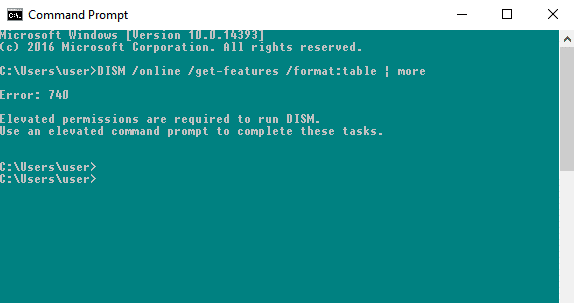 Open command prompt in administrative mode. It will display all the list of features enabled or disabled on your computer. Here format:table and more are optional and are used to improve the readability of the features. Keep on pressing Enter until you get the full list. You can remove more option if you don’t wan to get the full list. If you do not open that in administrative mode you will encounter the following error. 1- How to turn Windows features on or off? You can enable any Windows feature or can disable them. Some features are disabled by default. To enable a feature, check the checkbox beside the component. To disable a feature, un-check the checkbox beside the component. 2- How to turn Windows features on or off using command line? Copy the name of feature you want to enable. You may need to restart the computer for installing some components. Disabling Windows features is very similar to enabling them. Follow the steps below to disable any feature. Copy the name of feature you want to disable. You will get the detailed information about the feature name, description, properties , status and whether it requires restart or not. 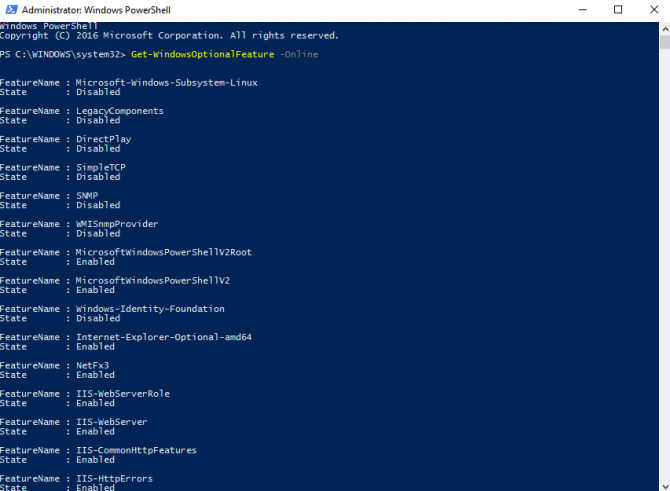 The benefit of PowerShell over using command prompt is that PowerShell commands check if the feature is already enabled. If it is already enabled, the installation action is not performed saving computing time. In order to enable/disable any feature use the following commands. 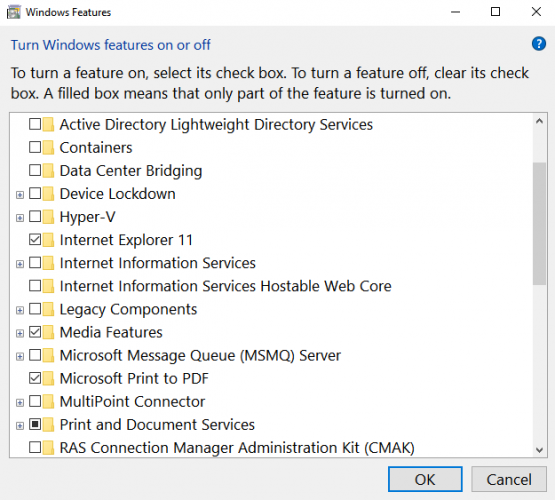 If a feature is not available for installation in installed Windows, we will need to give external source address to install the feature. The external source can be Windows installation ISO or any drive. Make sure that the path should be given correctly and installation media should be correctly installed. Moreover you need to know exactly the feature name you wan to add. Here the installation media is C drive. You should change the installation media according to the requirement you wan to install the feature. Once successfully installed remove the installation media. What are your favorite Windows features and which ones do you enable as essentials when you Install Windows?